Matrix mixer with four input and two output channels plus headphone jack. Mix 01 is an extensible 4 in / 2 out matrix mixer with a dedicated stereo headphone output. Crystal clear, transparent audio and precise control voltage mixing. 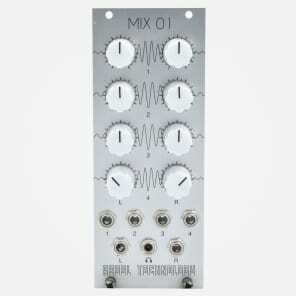 Several Mix 01 modules can be combined to make a bigger matrix with more inputs and outputs.